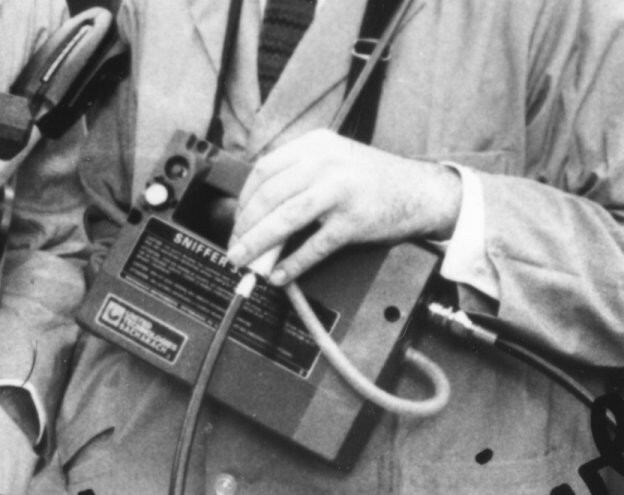 First seen in Ghostbusters during the commercial, the Bacharach Sniffer 300 was later used by Peter Venkman during the initial investigation of Dana Barrett's apartment. It appears to be calibrated for detecting ghost vapors, as Venkman refers to it as "one of our little toys". 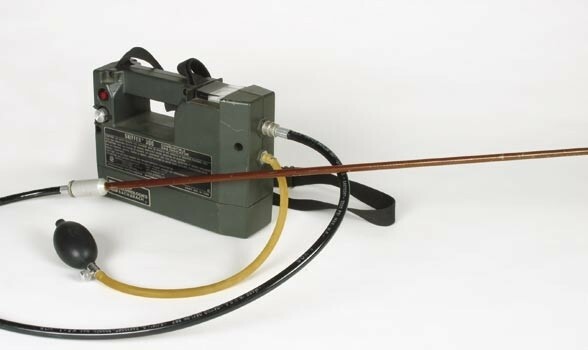 "Sniffer 300 Series gas indicators are lightweight, portable instruments designed for intermittent measurements of combustible gas and oxygen deficiency. Designed for intrinsic safety, the Sniffer 300 Series instruments meet various approval agency requirements for use in Class I, Divisions 1 and 2, Groups A, B, C and D hazardous areas." 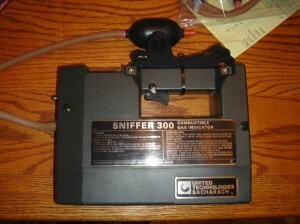 There are a few different Sniffer 300 series models. The model used in the movie was indeed a Sniffer 300. This unit is extremely difficult to find. What sets it apart from the other sniffers is that the sampling method required use of a hand aspirator, and the display used an analogue meter, whereas all later models used LCD displays. 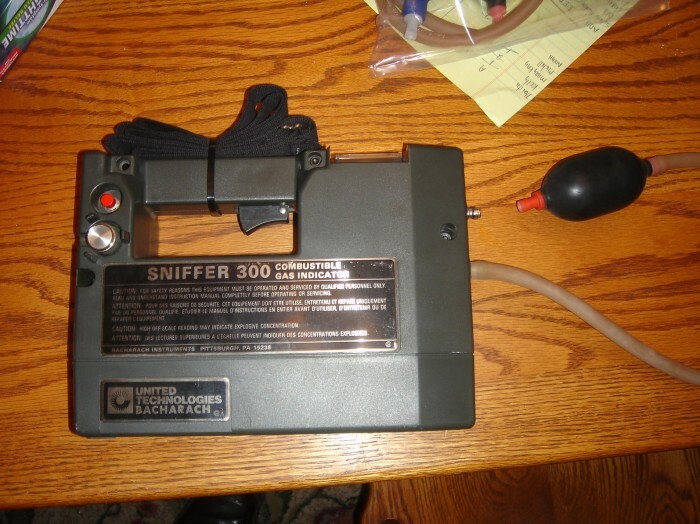 As you can see in the picture above, there are two attachments on the front of the 300 sniffer. The top attachment is for a sniffing probe assembly (see picture below). The bottom attachment is for the hand aspirator (also pictured below). The picture above is the sniffing probe assembly identical to the one in the movie. There are a few different probes out there for the 300 series sniffers, and this one seems to be the most difficult one to find. 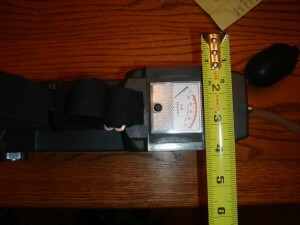 Overall, the length of the probe is 30 inches. It has a 2 inch metal base and a 28 inch copper-colored tip. I managed to track down 2 brand new probes unopened from an online source, and the part number for the probe assembly is 5500-1300. Some of these probes are a lighter shade of brown. The picture above is of the hand aspirator bulb. It is NOT a blood pressure cuff bulb. 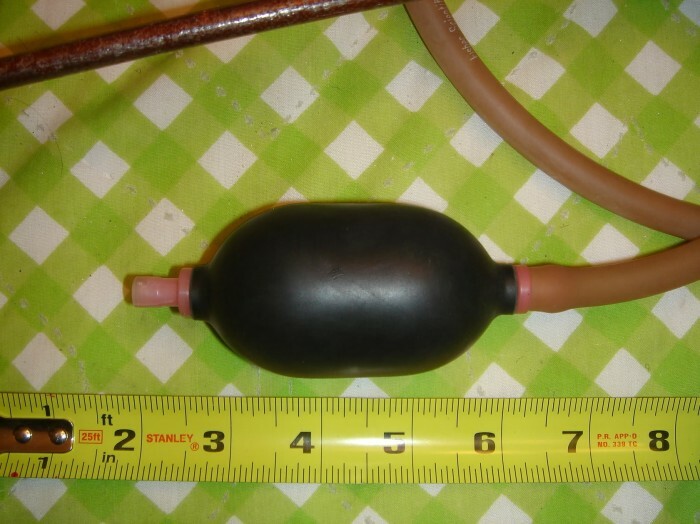 This is an actual aspirator bulb used by Bacharach for their older sniffers. Unfortunately, it seems as though Bacharach has not produced this specific aspirator bulb in quite a while. Newer aspirator bulbs are blue and can still be found online. Aspirator valves are little plastic parts that plug into each end of the bulb and allow for the "sniffing". Aspirator valves come in a number of colors. The valves in the movie were red. Newer aspirator valves tend to be clear and can also be found online. 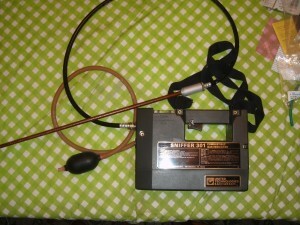 A rubber hose connects one of the aspirator valves to the bottom attachment on the 300 sniffer as mentioned earlier. It may appear as if the rubber hose connects to the 301 sniffer, but there is just a blind port in the location where the attachment for the hose would be on the 300 sniffer. Older reference photos courtesy of jettajeffro. Most other photos courtesy of SabaSka109.